Echo’s cries rehearse the utterance of others, departing as counterfeits without significance, returning diminished and disembodied ~ orphaned sounds. 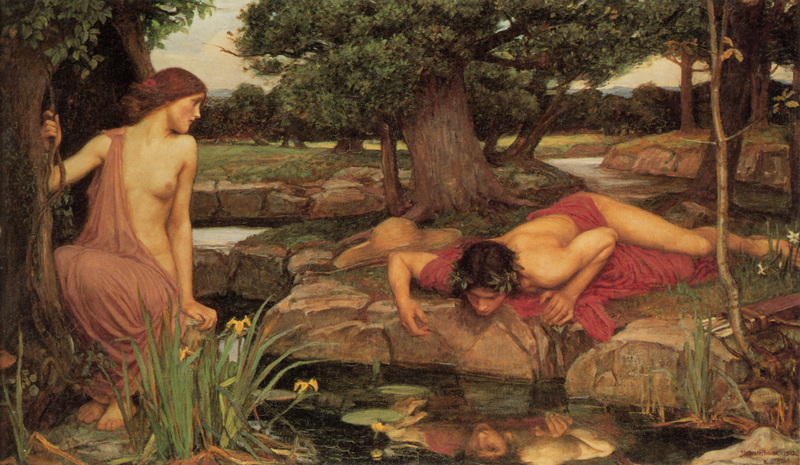 Narcissus swoons as he reaches out to caress the face that has him bewitched. As his fingers glance the perfect image it transforms into an animated mandala, formed of concentric algorithms far more complex than his melancholia. Smoke curls up from the Beacon Hill, to be answered in the distance by another and yet still another. A King has died, an Armada has breached the horizon. In every case a presaged message is unleashed ~ only the timing is significant. Stepping forward through the logic and logistics of the Enlightenment, writing ousts memory but unlike the transient voice, it has the ability to transpose and transport itself ~ it flies and it endures. But like everything it is subject to the 3rd law of thermodynamics, its clarion voice fading with distance. Poured into channels of Copper or sparked into the Æther language swims in an Ocean of Noise in constant fear of corruption, desperate for disambiguation. The message is quantised, fundamental particles taking the form of semaphore flags, dots and dashes, the texture of Braille. Speech and spelling are rehabilitated as military jingo-jargon, Alpha, Bravo, Charlies.